Really hope all of you in good condition and reach more success on your online biz day by day. Q: Can you verify ownership for this domain? 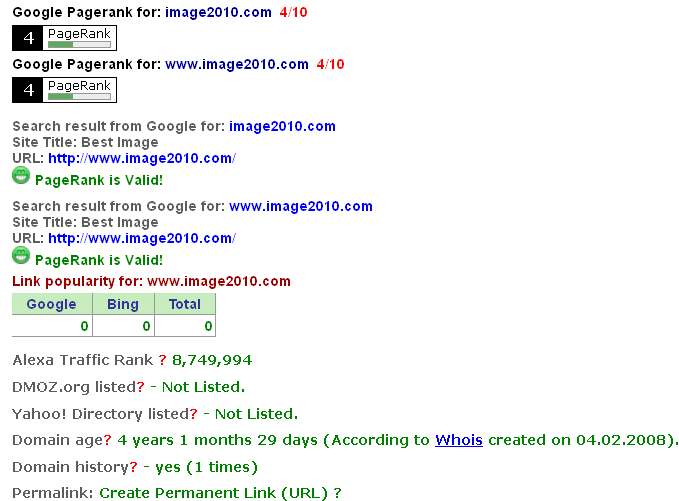 Q: Is it valid Pagerank? A: Yes, you can check it by your trusted tools to check validity this domain. Check not only with one tools/site to make sure. Q: Why you sell this domain? A: I'm one of domain seller. I have more than 100 site on my account, and I build up and maintain all of them but I just use several domains for my own business and the other I will sell to give another one take online business opportunities too. Most people out there success with their online biz, we must take opportunities to success too! Q: There isn't any backlink (There is not enough backlink) for this domain, whether domain pagerank can continue to survive? A: Yes, of course. We do not know for sure whether a domain pagerank will drop or not even though the domain has a lot of backlinks or not. But for your consider, please take a time to search my previously Auction thread, almost my domains that has been sold still have their pagerank , so you can make decision with confidence. We can add more backlink slowly. Take a time to read and consider, if you feeling good with one or more domain, then take it but if you are not feel good with that jump to another offer/auction. Tools are only tools but what you feel for something (in this case domain) is more important. I always hope all my buyer got what they need. So, if you take some domains from me, and you are satisfied, you can tell your friend.